Dated January through December planner features both one-week-per-two-page-spread and one-month-per-two-page-spread formats. Includes Julian dates. Each spread offers a full-color landscape photo, inspirational quote and six month reference blocks. 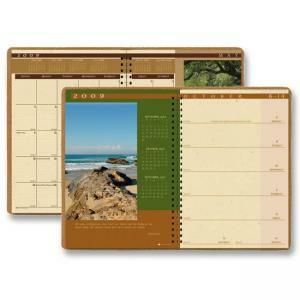 Planner provides a simulated suede cover, separate notes section, and is wirebound so pages open perfectly flat. Printed on 100% recycled paper that contains 1005 post-consumer material.